I suppose that really I should have gone straight to bed after the night shift… I didn’t. I loaded up the last of the camping gear I would need, and as I had my shower so the doorbell rang. Martin had got a taxi round with his gear. I told him off – I had every intention of driving round for him. We loaded up Martin’s gear and drove down to the fishing tackle shop for some maggots. I used to swear by “Ashford Tackle”; in the two years since I last went fishing they’ve been taken over by “Angling Direct”. They probably could have been more rude and disinterested, but they would have had to have made a serious effort. We then went on to Tesco for the makings of lunch, and then drove out to Smarden where I had a minor disaster. The idea was to use the cigarette lighter attachment of my power pack to charge my phone during the weekend. But as I unplugged my one and only adapter from the car it spectacularly exploded into about a dozen separate bits. Consequently power was at a premium, and I decided that as I was on holiday I would have a holiday from the Internet as well. The idea was that we would get the communal tent “Brown and Smelly” up, then my tent, then I would have a little shut-eye. It was a plan which suited me. But we did it in reverse order. We got my tent up, then “Brown and Smelly”, and after a rather good lunch of squeaky cheese and a pint I found my head nodding. I woke to find that Jimbo had arrived with the little dog he was looking after; I dozed off again and woke to find Terry and Irene were with us, I nodded off again and woke to find that "er indoors" had arrived with "Furry Face". Terry and Irene had prepared a curry for tea. Oh it was good. I had seconds. And I dozed off again. I woke to find everyone else had adjourned to bed. So I too went to bed. Being unable to power my CPAP machine I knew I would have a restless night. It didn’t help that the airbed I’d bought for a fiver had been money down the drain. I saw every hour of the night. I gave up trying to sleep shortly after 6am, and had a fit of the giggles when I saw "Furry Face TM". We’d set up his basket in our tent, and he definitely had a “what the hell is going on” expression as he looked around. Early morning fishing is traditional at Bat-Camp, and so I went to get my tackle. Jimbo and his pup had just got up too, and we made our way to the pond. We quickly set up (well, I did) and were soon catching fish (well, I was). However the fishing was slower than it had been in previous years. Where in previous years I might have had thirty fish before brekkie today I had six. 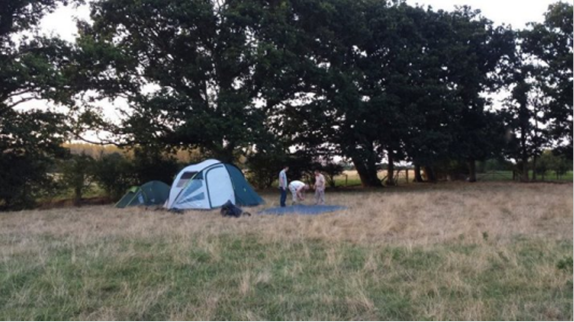 At nine o’clock we made our way back to camp and joined in the ongoing concerted tidy-up. Last night’s tea had been rather late. 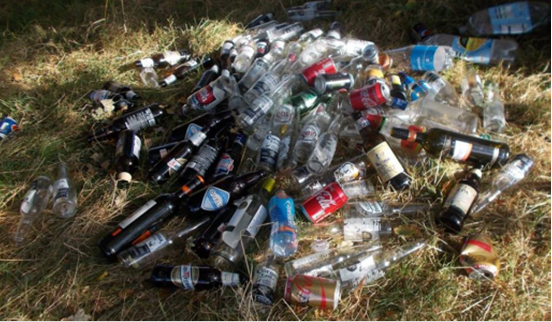 We had all agreed that clearing up the mess in the dark would have been silly, so we all tidied and washed up. I say “we all”; I did a load of washing up, then sat down, and woke to find the kitchen had moven outside to the open air, and that brekkie was ready. Brekkie was rather good, and as it was a rather warm day once we’d tidied it all away we had a little look around the pond closest to camp. 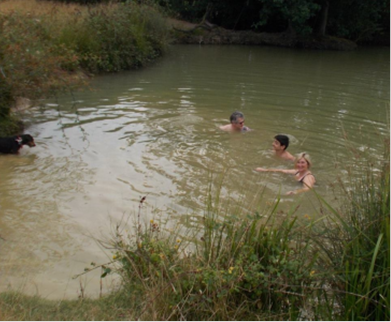 We’d fished in a pond further away because it wasn’t quite so overgrown, but the pond closest to where we camp has always been dear to my heart; possibly because on Sunday November the second 2008 I think I actually had cardiac arrhythmias in that pond. You can read all about it by looking up that date here. As we looked around the pond and got ripped to pieces by the brambles my dog found a fox’s tail and started trying to eat it. As I prised the brush from his powerful jaws I couldn’t help but wonder what had happened to the rest of the fox. We then set up the event shelter, sat in the sunshine and had a pint or two. Hic! Jose and Maria arrived, and we went back to the pond. Some fished, some swam, and Jose played with his new toy – he’s got one of those remote-controlled drones. He was using it to take aerial videos of what was going on. I was impressed; but surprised at how short the battery life is on those things. Just under half an hour. As the Hoseys left so Chris and Matt arrived. They set up their tents, and I watched from afar; offering sage advice as I drank more beer. Jimbo was on cookhouse duty; fajitas are always a camp favourite. I had too much to eat. And again time raced away from us. We’d made a point of deciding to have an early meal so we could tidy up in daylight, but again failing light meant we left it all until the next morning. Port was passed around, but not too much. Perhaps I’m getting old; in previous camps we would have emptied two bottled of port; this evening we shifted maybe a quarter of one bottle. My airbed was utterly flat; I was trying to sleep directly on a rather lumpy field. I woke at 1.30am with the most excruciating stomach pains. It was wind; it was probably going to be a fart, but I wasn’t going to take a chance. One of the things I don’t really like about camping is the toilet arrangements. I messed about in the darkness trying to find my boots, then staggered across the field to squat on a bucket only to find my suspicions were correct. It *was* only a fart. Mind you it was a rather impressive one at 1.30am. I’m not quite sure who gave it a round of applause but someone was clapping. 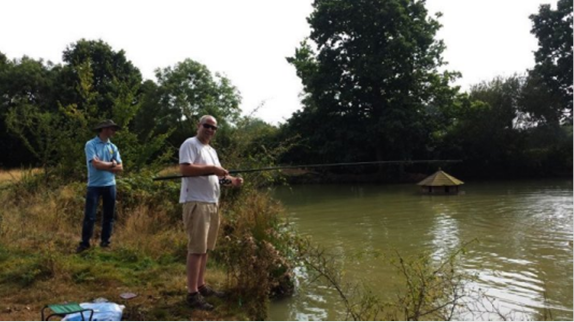 I went back to bed and dozed fitfully until 6.30am when I got up to go fishing. Jimbo soon joined me; he brought a cup of coffee with him. Sterling fellow! Perhaps it was rather mean of me to laugh when his stool then collapsed under his weight. Fishing this morning was somewhat brisker than yesterday; we both lost count of how many we’d caught by the time we had to go back to camp for brekkie. Brekkie was good; it always is at camp. I was about to start on the washing up when Tony offered to do it. I didn’t need telling twice, so we left him to it and went back to the pond for more fishing. We fished until mid-day. As for morning wore on so the fishing became slower. We gave up, and wandered round to the pond closest to camp. 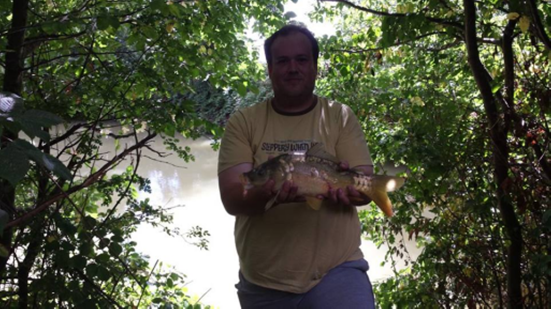 Matt and Chris had cleared back the brambles and were fishing for bigger carp. And they’d caught some too. then sat about chatting for a while until lunch arrived. Bread and cheese sounds a very simple lunch, but bread and cheese in a field can be heaven on Earth. We then played with "Furry Face TM" for much of the rest of the afternoon. Bearing in mind how ill he has been recently I was in two minds about taking him to camp, but the little break seemed to have done him good. On Friday Batty had bought him a pig’s trotter and he’d munched it during the weekend. And this afternoon he was playing his own variation of “fetch” with whoever would play it. It was with something of a heavy heart that I left everyone at 5.30pm. Camp carries on till tomorrow, but I really need a decent night’s sleep before work. I came home; much as I like camping, I like a shower and a real toilet too. I’m worn out… I’m off to bed.